Flo looks two examples of the strange and important ways that geology and where it’s located can affect international governance and regulation. From the presence of tiny coralline islands to ownership of the Arctic! I’ve always had an interest in the peculiarities of geology and geomorphology and the inordinate (sometimes almost absurd!) ways that they play their part in deciding on big international governance. Humanity has long-relied on the presence of geological features such as mountain ranges, coasts, rivers etc. to delineate ownership and basis on which to set ‘ground rules’.These geological features account for many historic and modern day national borders and so the odd rock in the right place at the right time can be very handy (or not, depending on which side of the coin you’re on…). Sometimes this works well, countries such as India and Chile use enormous, previously impassable mountain ranges such as the Himalayas and the Andes as their natural borders and this has worked relatively well. Island states such as the UK assume their land borders at the point where land meets the sea, which also works for now but is ultimately just a function of current sea level. But in a dynamic world, the formation and loss of landmass and particularly changing sea levels will be shifting quite considerably in the face of human-induced climate change, and so the previously established rules and regulations about ownership and governance may start to become and bit less solid than it was…so where does this leave us? 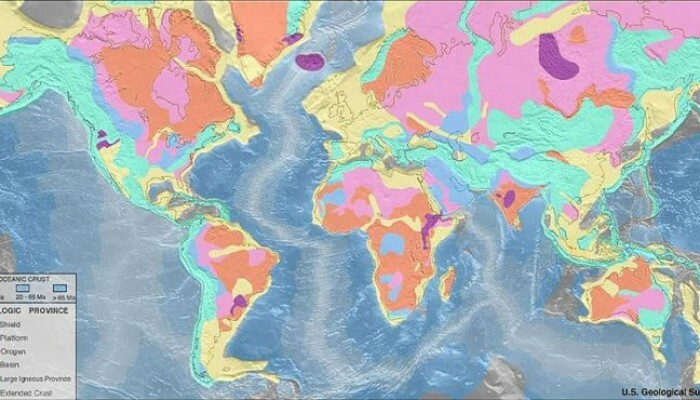 I’m going to look at a couple examples of where geological features have influenced the distribution of governance responsibility among nations, and just how flimsy that burden of proof can get! 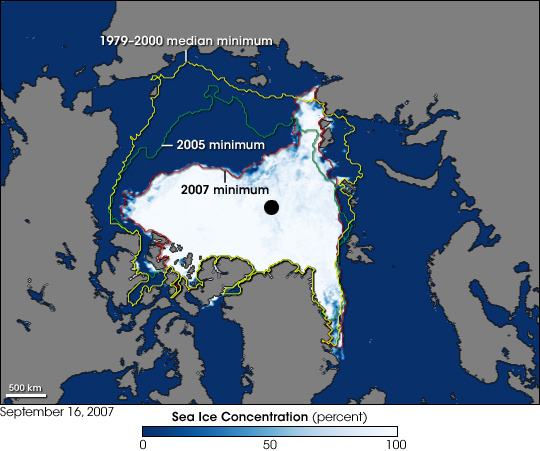 The image shows a record sea ice minimum in the Arctic, taken in September 2007. Image Credit – NASA, Wikimedia Commons. One great example of how small, uncontrollable things can influence major decisions and changes, is the right to ownership and governance of the Arctic. The ongoing in reduction of sea ice in the Arctic due to climate change and recent developments in technology that would allow development of Arctic resources has led to something of an arms race with countries laying claim to large tracts of the region. The scientific basis for many of these claims is based on the mapping of ocean ridges and where they sit in relation to the Arctic states (Canada, US, Russia, Denmark, Finland, Iceland, Norway and Sweden). 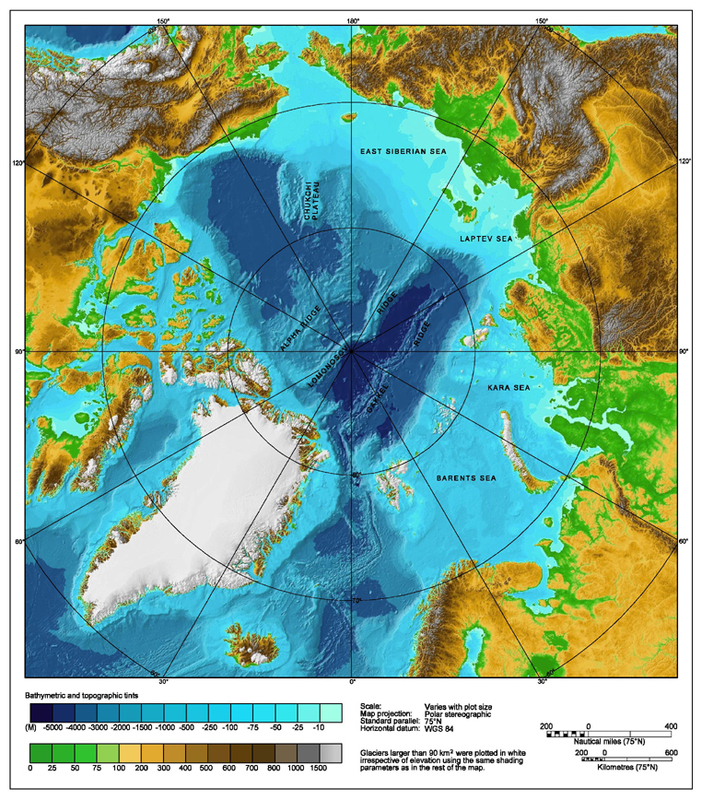 Bathymetric map of the Arctic Ocean. Image Credit – NOAA, Wikimedia Commons. 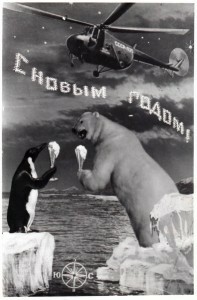 A USSR postcard depicting Soviet dominance of the Arctic! Image Credit – kristofer.b, Wikimedia Commons. nautical miles and there are also potential overlaps with claims by Canada, Russia and the U.S. Some people involved in the process had hoped that control of the Arctic would be decided on through a ‘Gentleman’s agreement’ rather than the tough negotiations that will now ensue. The United Nations panel will eventually decide control of the area, and the sea floor boundaries will be settled by international negotiations but this process won’t begin until the scientific data has been examined. This is expected to take 10-15 years, by which stage the politics around accessible resources in the Arctic will have intensifed due to increased global warming creating easier access to many of the oil and mineral reserves, so this topic isn’t going away! 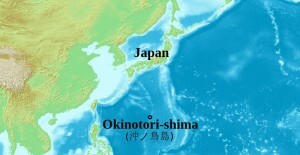 Location of the Okinotorishima islands in the Phillippine Sea. Image Credit – ForestFarmer, Wikimedia Commons. dependent on the existence of a habitable island landmass existing in the area. If this island sinks beneath the water then the whole claim to the economic zone sinks with it, along with important mineral and fish resources for Japan. The claim, even if the islands stay above water isn’t uncontested, China disputes the ownership stating that the islands are just a cluster of uninhabitable rocks and doesn’t fulfill the requirement of ‘habitable’ at all! While it’s true that no one lives there, the small area is host to a small man-made islet with a platform which is used as a weather monitoring station with a building that houses researchers. The usefulness (and contention) of these islands and their slow sinking has not bypassed the Japanese government who have set up programs (and considerable investment) to keep the islands bobbing above sea level. 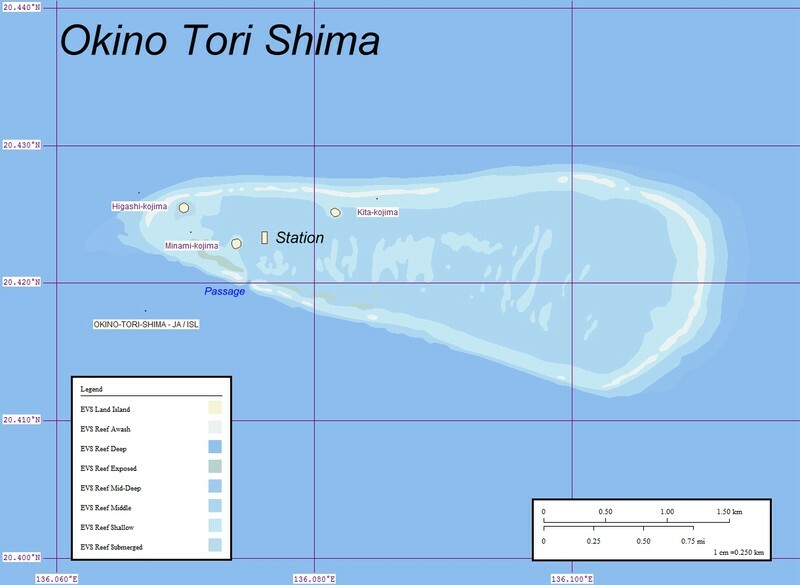 The project to keep the island above water is two-fold, the Japanese government have installed protection around the island in the form of cement, steel blocks and titanium mesh to protect from erosion and the increasing number of tropical storms. 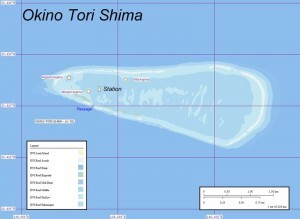 Map of Okino-Torishima, Pacific Ocean. Image credit – Ratzer, Wikimedia Commons. However the ‘sinking’ is not just due to erosion and damage but also due to the low production of coral. This is thought to be due to the warmer waters in the area lowering coral growth. This loss of landmass and the important politics associated with it has meant that several agencies have made it a priority to revitalise the growth of corals, although it’s not quite that simple! This involves applying a method of sexual reproduction developed over the past 20 years to cultivate corals. According to the fisheries agency, about $19 million ( of tax payers money…) has been spent to breed about 100,000 coral plants using the method with a success rate of approximately 20%. It remains to be seen whether this rock, doctored or otherwise, will be in the right place for the Japanese authorities in years to come…..
It’s worth reflecting that with both these examples, not only are they wholly reliant on the location of bits of geology to define long-lasting rules, regulations and potentially economic opportinities that can make or break countries but also these rocks (in a geological sense) are totally transient, and the ridges that secure the Arctic and the corals that secure the economic zone for Japan just happened to be in the right place at the right time. Throw in an exntending ridge of a destructive plate margin somewhere else and this fragile hierarchy would be thrown into disarray. BBC News – Denmark challenges Russia and Canada over North Pole. So George Osborne donned the ceremonial red briefcase on wednesday and took to the helm in the House of Commons (rather inconsiderately while I was in Brussels and couldn’t follow the news…) to deliver the Autumn Statement, one of the two statements that the HM Treasury makes each year to Parliament upon publication of economic forecasts (the other being the Budget which is normally announced in March-time). 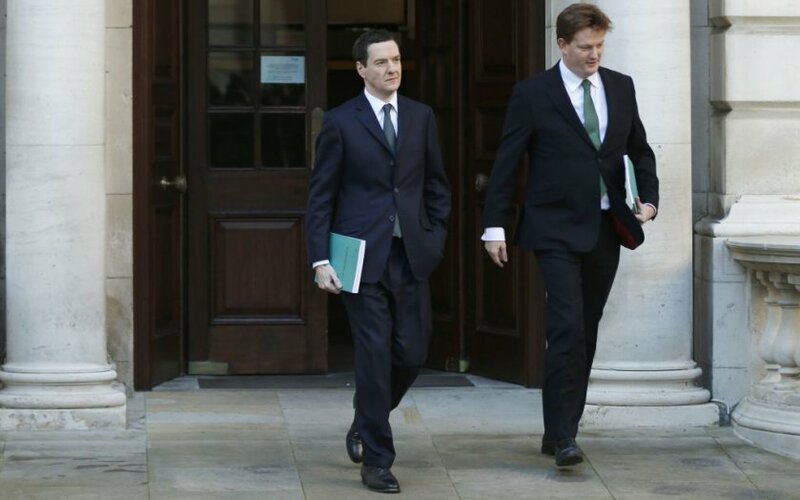 Statements in the run up to wednesday suggested that Science and Engineering were likely to be singled out as the Chancellor’s ‘personal priority. In amongst all this were some announcements which relate directly to geology and in particular, Energy. 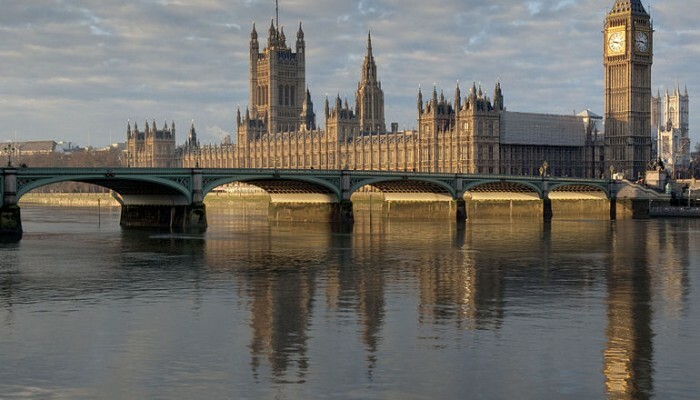 The government announced plans to help maximise the economic benefits of the oil and gas resources in the UK Continental Shelf (UKCS). They estimate there is between 11-31 billion barrels still to be exploited and argue that it can provide considerable eonomic benefits to the UK through much sought energy security, high-value jobs and other things. These plans include setting out major reforms to the oil and gas fiscal regime which include a 2% reduction in the rate of the Supplementary Charge from 32-30%. See 1.124 and 1.125 in the ‘Green Book‘ for more details. The UK government has long championed shale gas development as a tool to increase the UK’s energy security, create new jobs and create tax revenue. As part of the government’s ongoing progress in shale gas development, the Autumn Statement detailed a new ‘£5 million fund to provide independent evidence directly to the public about the robustness of the existing regulatory regime’. The reasoning for this is that it will ensure the public is better engaged in the regulatory process. See section 1.121 in the ‘Green Book‘ for more details. An interesting inclusion is a £31 million fund for investment into creating so-called ‘sub-surface research test centres’ through the Natural Environment Research Council (NERC). These will be designed to develop world leading knowledge of energy technologies such as shale gas and carbon capture and storage. See section 1.122 in the ‘Green Book‘ for more details. As part of the governments commitments to decarbonisation targets they have announced plans for ‘closer discussions’ with the company managing the project at Swansea Bay, Tidal Lagoon Power Ltd to establish whether a tidal lagoon project is affordable and value-for-money for consumers. If this project were to progress it could become the first tidal lagoon project in the world. For more information on the proposed tidal lagoon project see this story on the BBC News Website and see 1.129 in the ‘Green Book‘. Swansea Bay where the new Tidal Lagoon would be located. Source – Kakoui, Wikimedia Commons. And lastly there was a pretty important note about Postgraduate Taught Masters funding. The geological community has been dismayed at the lack of funding for postgraduate taught masters for sometime in particular becuase many of the Taught Masters Programs (such as Petroleums Geophysics and Hydrogeology) are seen as essential for careers in these areas. The lack of any funding framework for such courses, and the reduction in Industrial funding and scholarships has put real pressure on students wanting to pursue careers in this highly technical area. The government announced in the Autumn Statement that it will introduce a postgraduate loans system offering £10,000 to students under 30 (bit mean!) from 2016-2017. A consultation to inform the design of the scheme is set to follow early next year. For more information on this announcement see this piece in the Times Higher Education webpage. 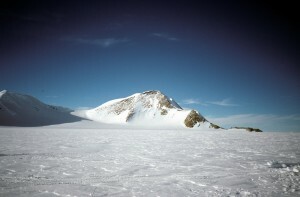 Brand Peak , Antarctica. Source: euphro, Wikimedia Commons. The Earth’s surface temperatures can have a profound effect on the Earth’s ice sheets, the huge layers of ice thousands of metres thick that cover Greenland and Antarctica. Over the past few decades, satellites have monitored the changes of these icy landscapes, revealing that parts of Greenland and West Antarctica are melting. This is important as it contributes to sea level rise, which can have significant impacts on vulnerable coastal lands. Pine Island Glacier in West Antarctica, seen from NASA’s DC-8 research aircraft, 2009. Source: NASA/Jane Peterson. So far, however, East Antarctica’s ice sheet, the largest on the planet, has been seemingly stable. 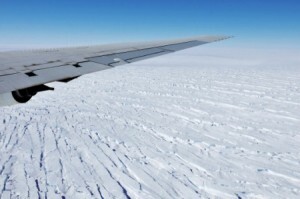 One big question Earth scientists have busied themselves with is just how stable this ice sheet is, and whether or not it will be affected by the continuing CO2 emissions and rising temperatures that are projected for the coming century. To try and get some answers, scientists can turn to the past. By looking at rocks or sediments that covered the Earth thousands or millions of years ago, at times when the Earth’s climate was either similar or different to today, they can study how the environment responded to these changing climates. 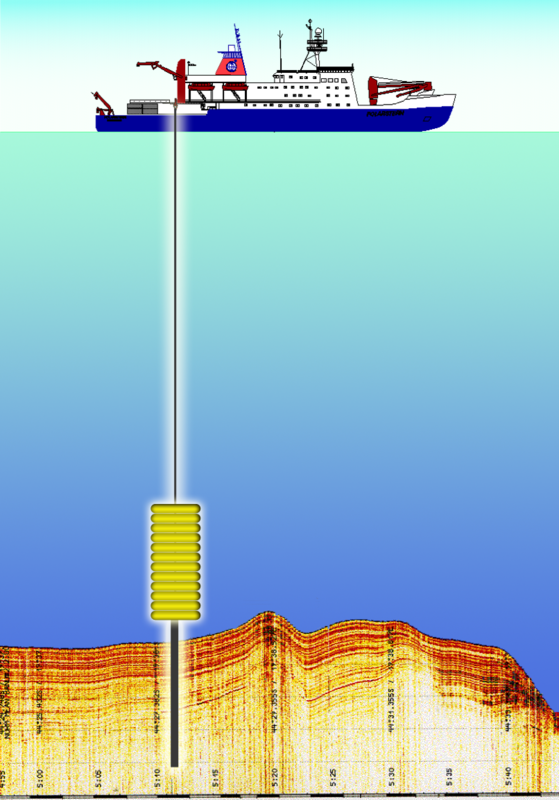 Sketch of a core being sampled from the seafloor. Source: Hannes Grobe/AWI, WIkimedia Commons. Between about 5 and 2.5 millions of years ago, during a time we call the Pliocene epoch, the Earth’s climate was very similar to that which scientists predict for the end of this century. Temperatures were about 3°C warmer than they are today, and CO2 levels were similar to those that are found in the atmosphere at present. By going to the bottom of the ocean and studying ancient Antarctic sediments from this time, Earth scientists can try to paint a picture of what Antarctica looked like under these conditions, which scientists suggest we may be facing in a few decades. 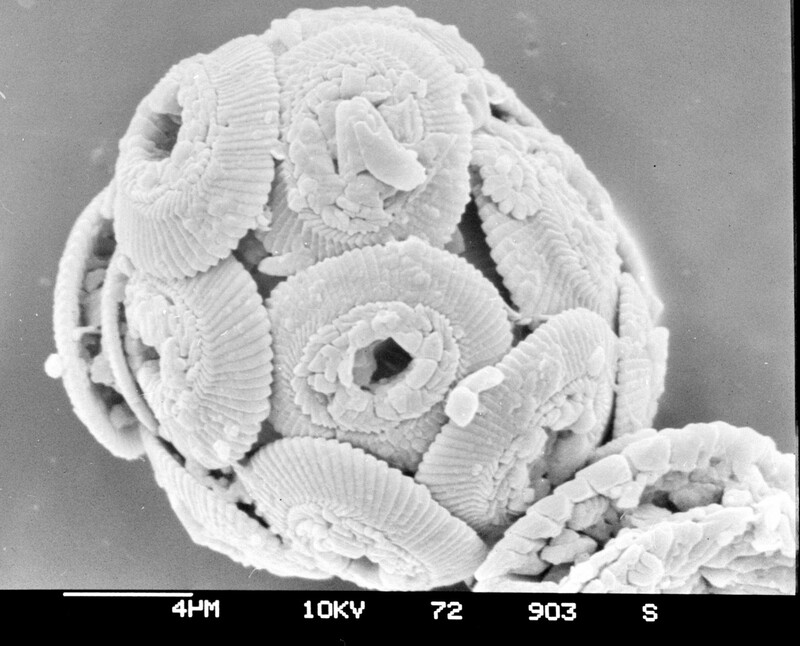 The chemical composition of buried sediment grains, dust and tiny algae can reveal information about the temperature of the water, its salinity, and also where the buried material physically came from before it found its way to the bottom of the ocean. 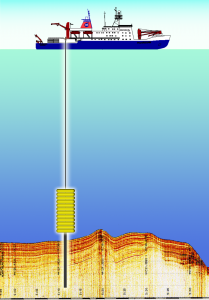 By using very sensitive geochemical fingerprinting tools, scientists have for example found that sediments taken from the seafloor 350km off the coast of East Antarctica had originally come from a region of Antarctica called the Wilkes Basin, today buried deep under the ice sheet. For material from the Wilkes Basin to have been eroded and transported to the bottom of the sea, this region must have been out in the open and ice-free. This could suggest that during warmer periods of the Pliocene, part of Antarctica’s giant East ice sheet did melt, and scientists think that such an amount of melting would have contributed to between 3 and 10 m of sea level rise. Today, such a rise, if it were to happen, could have important consequences. Microfossils from a sediment core. Source: Hannes Grove/AWI, Wikimedia Commons. Geological results such as these, not only from Antarctica, but from across the world’s oceans and seas, can provide important new constraints to help scientists understand what sort of environmental changes we may be facing tomorrow. 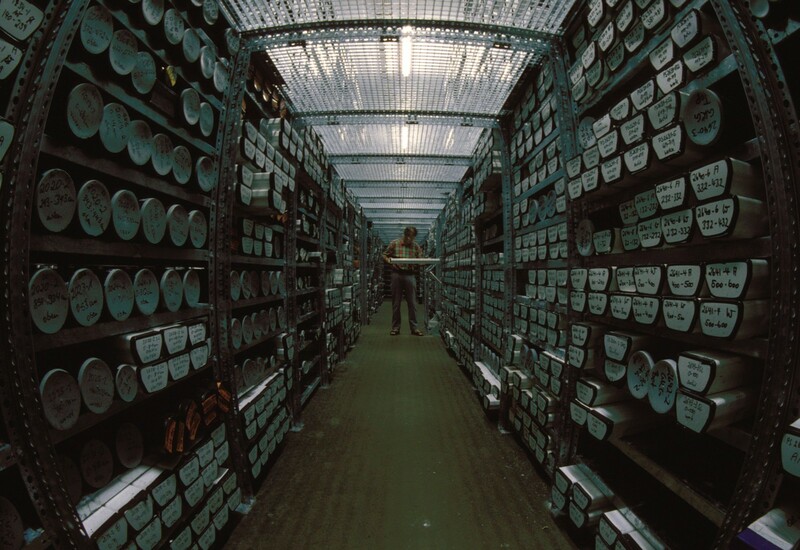 Geological core repository for sediment samples. Source: Hannes Grobe/AWI, WIkimedia Commons. 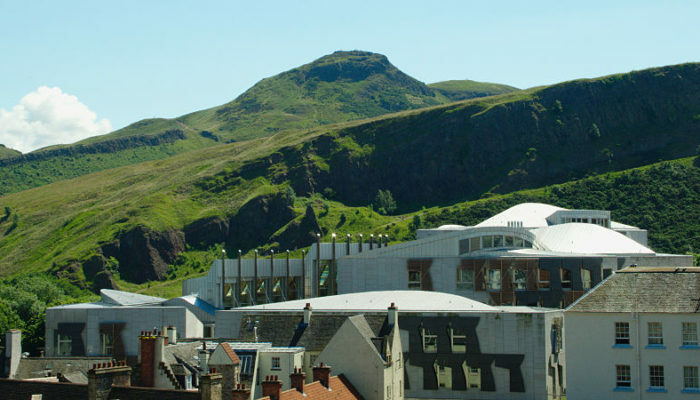 Flo summarises 5 geo-relevant policy issues that are likely to impact on the Scottish Independence Referendum. Sooooo apologies for the long blog holiday we’ve been on of late, Marion and I have had a fairly hectic summer, but fear not, we will be updating on a more regular basis from now on! Source – Wikimedia Commons, Credit: Smooth_O. Hitting the headlines in the UK this week is the impending referendum for Scottish Independence taking place on the 18th September. Latest polling suggests that the vote outcome is on a knife-edge. Either way, the build-up and inevitable political wrangling after the result undoubtedly means that the situation has changed for everyone, regardless of the outcome. One thing is for sure: the implications of an independent Scotland means big changes for both countries, the shape of which is still little understood and requires much discussion in the negotiation stages. Taking a sidestep from the core politics for the moment, I’m going to have a brief look at 5 geology related topics in the run up to the referendum that could be affected, for better or worse depending on your point of view, by the decisions made next week! This topic, like others with a geopolitical element, tells another interesting story about the link between the fortuitous geo-location of resources and the creation of nation states. 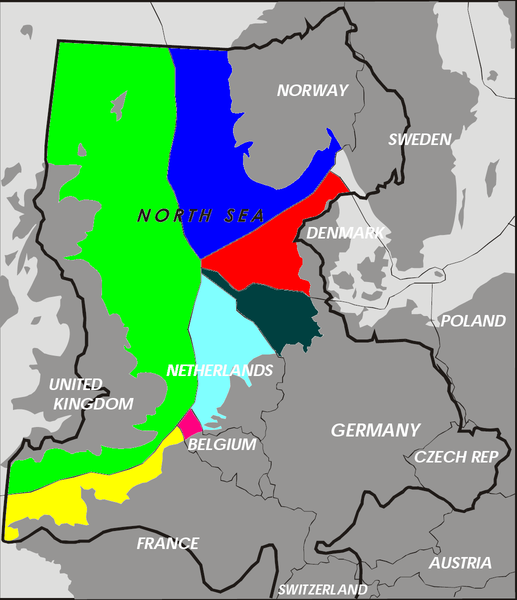 Exclusive economic zones for the North Sea, the green refers to the area covered by the UK Continental Shelf. Source – Wikimedia Commons, Credit: Inwind. North Sea oil and gas has formed a significant proportion of revenue for the UK since the mid 60’s when the UK Continental Shelf Act came into force. Since then the UK government, via the UK continental shelf economic region, has controlled licensing of hydrocarbon extraction. This has been a particularly crucial source of revenue for the UK which peaked in 1999 with production of 950,000m3 (6 million barrels a day). In an independent Scotland, income from the remaining hydrocarbons in the North Sea would provide a considerable amount of revenue, but the rights over the North Sea, in the event of an independent Scotland are unclear, as it is yet to be negotiated. The majority of the confusion over this issue arises from the line in the North Sea that would demarcate Scottish territory. Many agree that this is likely to be drawn along the ‘median line’ or ‘equidistance principle’: a ‘line between the nearest points of land on either side using the baselines established around the coast of the UK in accordance with international law’ (from the UK Government’s Scotland Analysis: Borders and Citizenship). On this basis, Scotland’s share of the North Sea would be somewhere between 73-95% according to different sources. Further complications lie in the debate over the estimates of reserve remaining and whether it is more difficult to extract (geologists will be more than familiar with this sort of uncertainty!!). 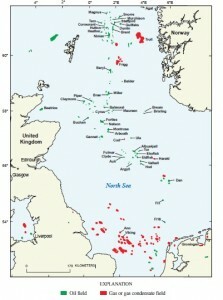 North Sea oil and gas fields distribution. Source – Wikimedia Commons, Credit: Gautier, D.L . A fact check produced by Channel 4 earlier this year cast doubt on the values of remaining reserves. These unknowns have made confident and informed arguments on this topic difficult for both sides. This may not be critical, however, as leaving the North Sea out of the Scottish economy completely, it is still a thriving economy: only slightly smaller than that of the UK. 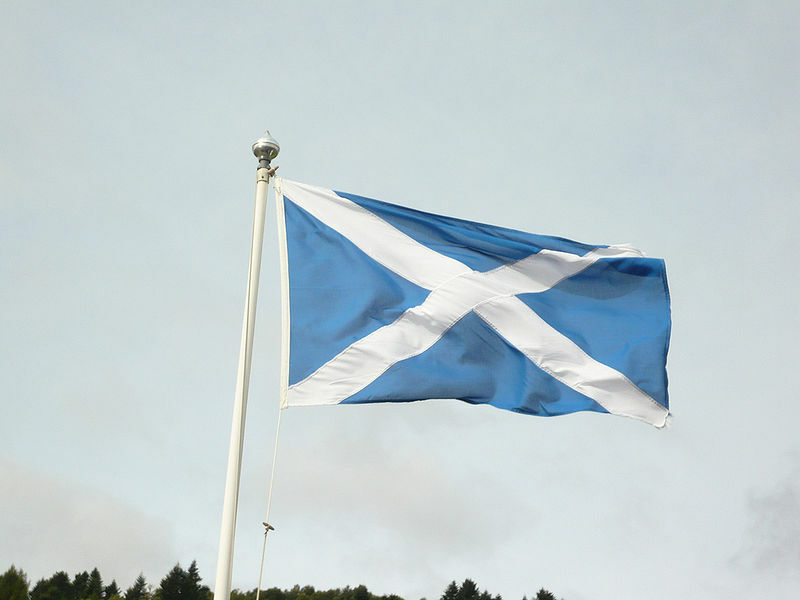 Another issue that has been discussed in the run up to the Scottish independence referendum is Scotland’s shale gas reserves and the issue of fracking. A report published just last week by the N56 business body claimed that fracking of what would be Scotland’s oil and gas reserves could almost double the amount recoverable from oil and gas in the North Sea, the target being the Kimmeridge Bay formation, an Upper Jurassic organic rich shale which is the major oil and gas source rock for the Central and Northern North Sea. The BGS has since debunked this estimate stating that there is only “a modest amount” of shale gas and oil reserves. 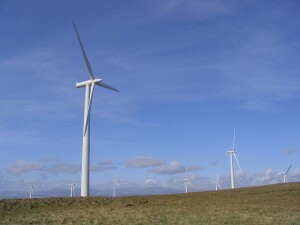 Wether Hill, Dumfries and Galloway wind farm. Source – Wikimedia Commons, Credit: Walter Baxter. Scotland has some pretty impressive environmental credentials when it comes to renewable energy, a staggering 69% of Scotland’s electricity was generated from a combination of renewables (29.8%) and nuclear (34.4%) in 2012. Scotland has a massive renewable resource and the Scottish National Party (SNP) have been vocal in stating that they want to make Scotland the green capital of Europe. The Yes campaign website states that ‘Scotland is on target to meet all of its electricity needs, and 11% of its heat requirements, from renewable sources such as wind, wave, tidal, solar and biomass by 2020′. As it stands, control over energy policy and funding resides with Westminster. 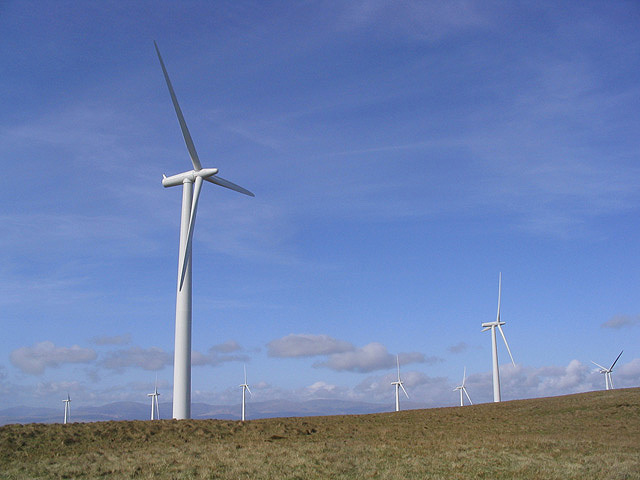 The Scottish Government has shown a commitment to low-carbon energy sources in its 2009 paper which introduced ambitious plans to reduce emissions by at least 80% by 2050. 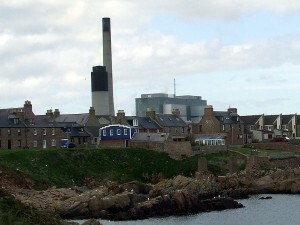 Peterhead Power Station, Site of DECC CCS funding. Source – Wikimedia Commons, Credit: PortHenry. After some very slow progress in the DECC CCS competition (see my earlier post on this), the shortlist (not even the final selection) was eventually announced last year with two shortlisted sites, one of which is the Peterhead Project off the coast of Aberdeenshire, which has been awarded a funded contract to undertake front-end engineering and design studies. The Peterhead Project may well have an uncertain future if the referendum turns out a ‘Yes’ result. 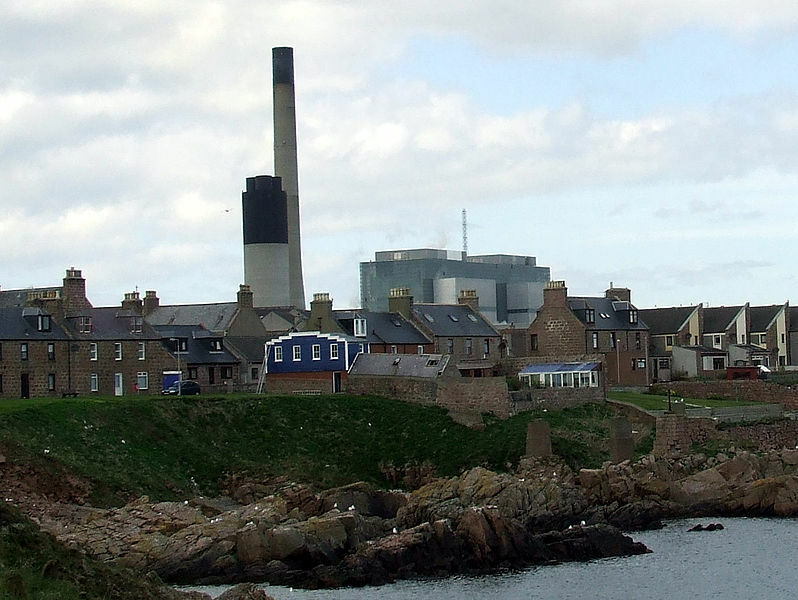 Energy Secretary Ed Davey admitted that the progress of the Peterhead CCS plant would be significantly trickier in the event of independence. While the Yes campaign has outlined its low-carbon credentials, a future Independent Scotland may find it hard to justify funding the very expensive CCS scheme alone. We could, however, end up in a situation where rUK (rest of the UK – the successor state in the event of Scottish independence) projects send their CO2 to storage sites in the North Sea, the revenues of which would go to an independent Scotland. This would mean that Scotland could still benefit from CCS development even if development at Peterhead is cancelled. 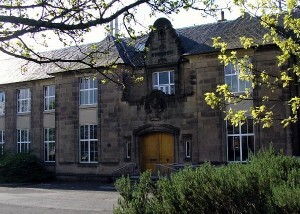 Grant Institute, School of Geosciences, Edinburgh University. Source – Wikimedia Commons, Credit: Kay Williams. Much has been written about the future of science research and funding in the event of a Yes vote at the referendum. Some groups of scientists have come out to say that a Yes for independence could damage the country’s research base and hurt the economy, this was stated most recently by the presidents of the Royal Society, the British Academy and the Academy of Medical Sciences. 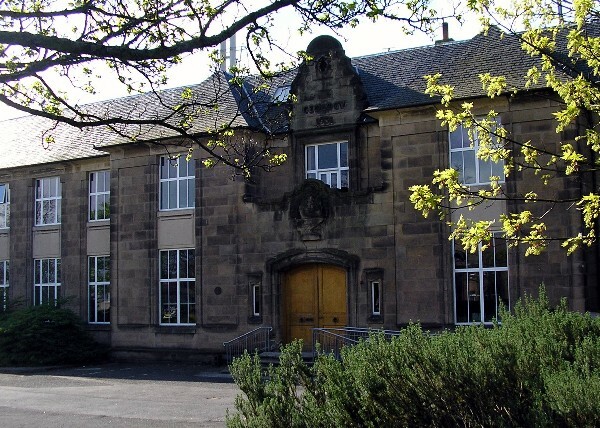 In contrast, the ‘Academics for Yes‘ group states that Scottish independence will secure and enhance the international profile of Scottish universities and also boost work between the research sector and the government to develop Scotland’s economy, as well as giving them control of research priorities. A piece posted just this week in Nature showed that opinion is split with regards to the impact of independence on science research and funding, with some touting improved innovation under independence and others saying that the border would hinder the open exchanges under which science thrives. 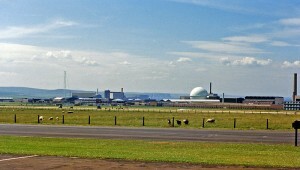 Dounreay nuclear power development, Caithness. Source – Wikimedia Commons, Credit: Ben Brooksbank. the bundles of uranium pellets encased in metal rods that have been used to power a nuclear reactor. Nuclear fuel loses efficiency over time and periodically, about 1/3 of the fuel assemblies in a reactor must be replaced. The nuclear reaction is stopped before the spent fuel is removed. But spent fuel still produces a lot of radiation and heat that must be managed to protect workers, the environment and the public. Spent fuel is not currently classified as waste, and therefore can be traded and sent overseas for processing, whereas this is banned for material classified as ‘waste’. 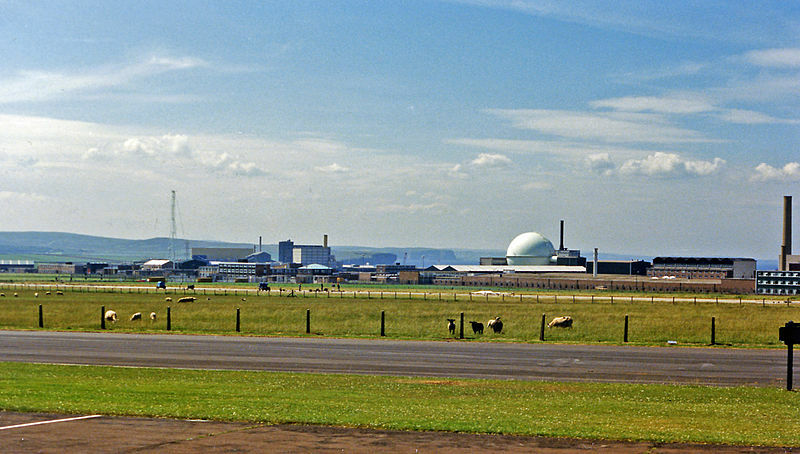 Currently, the Thorp Reprocessing plant at Sellafield accepts spent fuel contracts from around the world (including Scotland), that would include an independent Scotland. However, the Thorp plant is due to close in 2018 when current contracts have been completed. This may create an issue with any remaining spent fuel in the UK, regardless of an independent Scotland. However, if either an independent Scotland or the remaining UK decided to reclassify ‘spent fuel’ as waste, this would remove the option to export waste for processing and would require an independent Scotland to develop additional infrastructure to deal with this new waste. BBC News – Who has a right to claim the North Sea?